Hello friends, the countdown to turkey day is on? Do you believe that I didn’t realize that Thanksgiving was this Thursday until just the other day. I kept thinking we had another week. Anywho, here we are once again, a Sunday Stylin Roundup and in keeping with last week’s theme, today it’s Black N Bootie. I wore my booties with two different outfits both of which I love but of course the leopard prints are my favorites. This vest was thrifted from Goodwill about 2 years ago, however, I’ve only worn it one other time. 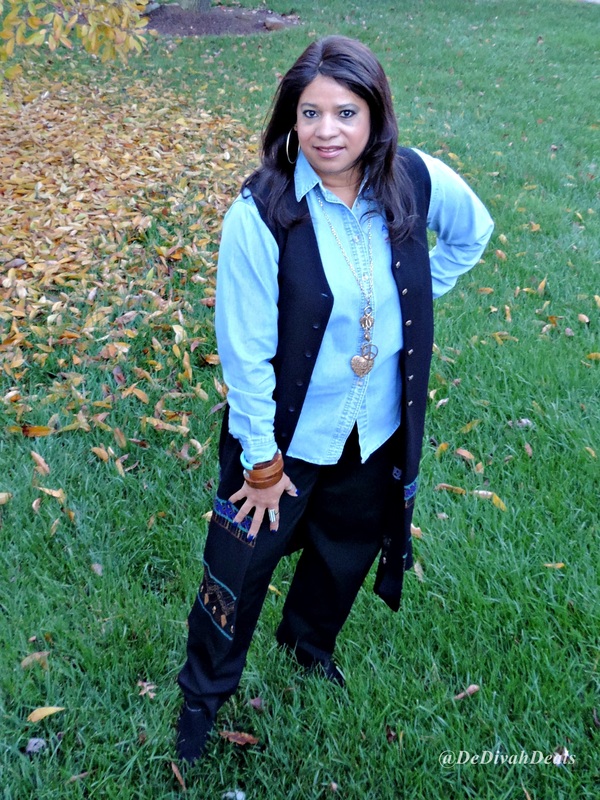 It is actually covering this Avon embroidered chambray shirt. The black suede booties are Unlisted purchased a couple of years ago from The Shoe Dept in the Exton Mall. Necklace is from Jewelrymax.net and bangles from Rugged Wearhouse. You know that these are my favorite pair of booties – who doesn’t love leopard? 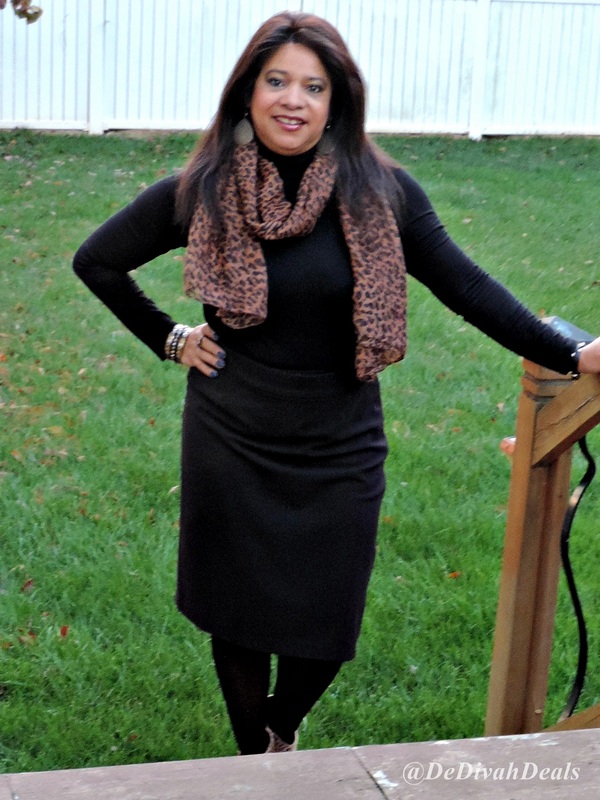 In both outfits I am wearing closet staples, black slacks, skirt and turtleneck which personally are not my favorites but the weather called for it. I wore the leopard print scarf to break up all the black. This outfit actually received quite a few compliments from co-workers. I am using my old camera which for some strange reason is not taking as good of pictures as it used to, oh well I guess I’ll start using the Coolpix L830, however, it uses 4-AA batteries and I hate when batteries start to drain. Next week, let me know if you notice a difference. Enjoy the rest of the day and I hope you finished your grocery shopping…I haven’t even started mine yet! Great outfits but the all black with the leopard is my fave. You look so Chic!!! 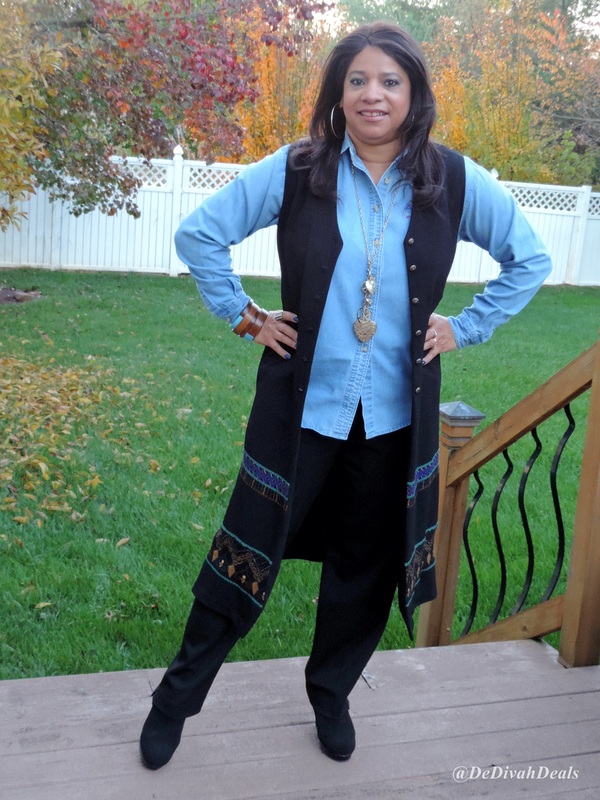 Thanks Blog Sistah – Happy Thanksgiving! Eat ~ Drink and Be Merry! Lisa, thank you so very much. Happy Thanksgiving my dear. 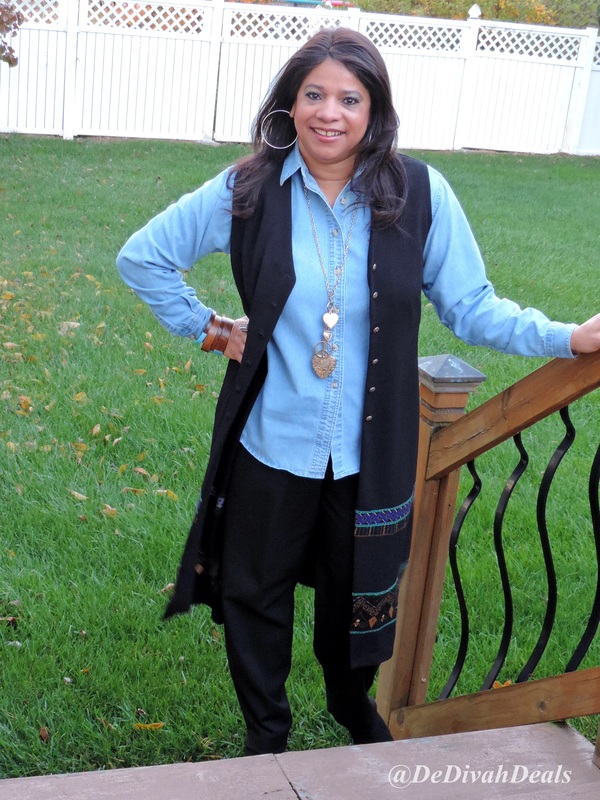 Denim and Southwestern is so in right now… Great top outfit!! Thank you my dear, I try to stay in fashion – lol Happy Thanksgiving! That 1st look is so great, sis! Love the long vest! That all black with the animal print booties is too cute! Thank you, I love my animal prints!